Produced in collaboration between NOAA’s National Geodetic Survey (NGS) and The COMET Program, this video explains the role of topo-bathy lidar products in NOAA’s mapping and charting program, and how these products provide a critical dataset for coastal resilience, coastal intelligence, and place-based conservation. 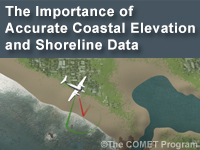 Federal, state and local decision-makers, coastal zone managers, community planners as well as general and scientific users of mapping products will find this 4-minute video helpful for understanding the benefits of coastal elevation data produced by NGS. Basic information on how to understand this course. The information will enhance the knowledge of the novice learner.